Tie-dyeing is one of the post-weaving physical resist-dyeing techniques using binding and compression to create patterning in textiles. This basic hand process involves binding or tying a raised portion of whole cloth with thread, string, twine, raffia, rubber bands, rope, or other linear materials to "reserve" or protect areas from receiving dye penetration during a vat-immersion or dip-dye process. Although dyeing is considered a "surface" technique, through this method the dyer can create random or controlled patterning and color manipulations that are fully integrated into the fibers of the cloth. According to Jack Lenor Larsen, leading textile authority and designer, "The marriage of thirsty cloth and liquid color produces ornament not on cloth, but in it" (p. 9). After dyeing, when the ties or resists are removed, the resulting pattern is created from the original color of the cloth, usually some version of white or light color that was bound off, contrasted with the dyed portions. The entire process may be repeated, and layers of color from over-dyeing or selective topical spot-dyeing increase the possibilities for complexity of imagery and patterning. Furthermore, the inherent crimped and puckered textures created by the compression contribute to the tactile and aesthetic appeal of the textile. The origins and evolution of traditional tie-dye methods are based upon the almost universal observation that areas of any foundation material protected from exposure to liquids, gases, heat, sun, or other substances, are left untouched in their original color or state. As a result of this protection or "resistance" to the flow of dye, the potential for controlled mark-making and patterning was discovered and subsequently explored and exploited. Typically the most basic patterns-circles, dots, squares, and diamond shapes-are repeated in varying sizes and scale. Japanese technique in which the cloth is compressed and tightly pleated as it is wrapped around a long pole, tied in place and dyed, giving an irregular, diagonally striped pattern to the fabric. The term arashi literally translated means "storm," as the pattern simulates the linear pattern of rain (Wada, page 34). A type of compression resist in which the cloth is folded and tightly clamped using C-clamps between a pair of two identical shapes cut from wood, plexiglas, or other dye-resistant material. The resulting reserved shape is repeated throughout the cloth based on the number of layers folded and clamped together while the surrounding area has received dye. Wet cloth is dipped into a series of dye baths containing increasingly darker values of the same or related color or along the edges of a folded bundle of cloth. The cloth is folded into small pleats so compactly that it resists the dye and is bound together with string at intervals. A variation includes twisting the folded bundle, further giving an irregular repeat design to the fabric. The simplest form of physical resist involves tying the rectangle of cloth on itself in knots in the corners and center before dyeing to produce bold, turbulent patterns. Three strips of fabric are folded lengthwise and plaited together in a threefold braid and secured by string at the bottom before immersion in a dye bath. After dyeing they are unbraided and machine-stitched together with other braid-dyed strips side by side to form a wider cloth. The resulting pattern is an offset repeat of the exposed areas with a fringe-like edge where the ends were tied off; practiced in West Africa. Javanese word for a resist-dye process in which out-line patterns are stitched into a double-layered cloth using small running stitches and tightly gathered to prevent substantial penetration of dye. This creates a "mirror image," or double rows of parallel lines of undyed dots. "A resist-dye process in which the resist, usually wax, is applied to the cloth surface; when dyed, patterns are reserved in the colors of the foundation material. Sequences of waxing and dyeing result in multiple color pattern" (Gittinger, p. 240). Other resists include cassava-based paste used in Africa and rice-paste resists used in Japan. "A resist-dye process in which patterns are created in the warp or weft by tying off small bundles of yarns with a dye-resistant material prior to weaving. Resists are cut away and/or new ones added for each color. When all are removed the yarns are patterned, ready for weaving" (Gittinger, p. 240). Yarns can also be executed as a "double-ikat" in which both the warp and the weft are resist-dyed prior to weaving. The same technique is called kasuri in Japan; in Central America. It is believed that tie-dyeing developed in conjunction with indigo cultivation and has been widely practiced by peoples throughout the world for centuries to decorate their clothing, including in India and Indonesia, Japan, Central Asia, West Africa, Europe, Mesoamerica, and South America, notably in pre-Columbian Peru. It was introduced to Europe in the seventeenth century by cotton calico fabrics that were usually made by resist printing. Silk-printed squares from India used as neck cloths or snuff handkerchiefs, the bandanna, with characteristic dot patterning, is derived from Hindu bandhnu (to bind or tie). This technique is also called plangi among Malay-Indonesian peoples and shibori in Japan. Most recently, tie-dye was revived during the twentieth century as a major part of the 1960s "hippie" aesthetic thought to capture psychedelic phenomenon. Specific countries and cultural areas have developed highly sophisticated and complex tie-dyeing traditions that are unique to their cultures. Historically, there is evidence of ancient Chinese silks from the ruins of Astana (418-683), one of a number of towns along the Silk Road, the great trade route that connected East Asia with the centers of western civilization, that used tie-dye methods to create patterned textiles, as well as in ancient Persia and the Middle East. Parts of rural China continue to use tie-dye, as do areas of Japan. Similarly, India developed plangi, in which tiny dots of tie-dyed cloth create larger patterns and motifs as well as rich, puckered textures. Rural areas of India still embellish their saris, veils, and turbans for both daily and festive wear using tie-dye patterning. Textile artisans, probably before recorded history in Japan, began to develop an elaborate array of highly controlled techniques for resist-dyed cloth, termed shibori, that was associated with particular geographical regions and became the "intellectual property" of specific villages and family groups. Most of the early patterns were based upon drawing up a portion of the cloth with the fingers and binding it around and around with thread before immersing it in the dye. The resulting patterns resemble rings, squares, or "spiderwebs," called kumo shibori (Wada, p. 17). A variation of the tie-dye process, usually known to textile historians by the Indonesian (Javanese) term tritik, or stitch-resist, is a technique in which the outline of the design is delineated with stitches and the stitching thread is drawn up, making it possible to protect ground areas from the dye. In Japanese textiles this technique reached its perfection in the sixteenth century. Rural peoples concentrated on indigo-dyed cotton cloth used for kimonos or short jackets, called hippari, while silk court robes and obi sashes utilized a vast array of colorful dyes. Traditional imagery was given specific names, such as, yanagi shibori (willow) or mokume shibori (wood grain), and can be recreated with recently recorded and published methods. 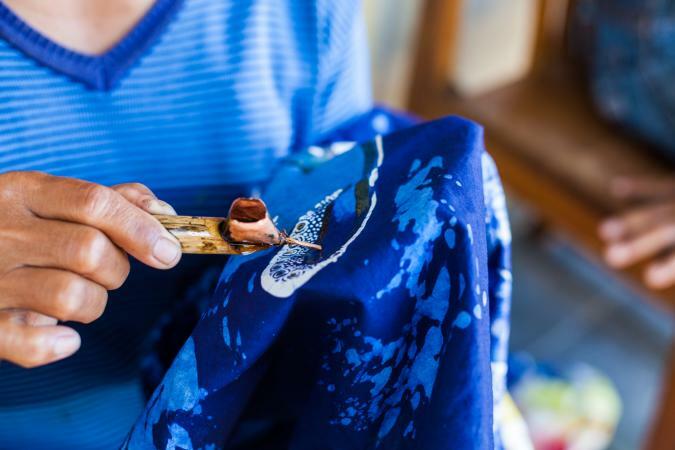 West and North Africa have specialized in indigo tie-dyed cloth, which was originally introduced through the Jewish dyers and merchants within the Muslim world. The combination of folded and bound resists with the special nature of indigo dye that requires oxidation to produce the blue color allows the textile artist to repeatedly expose the cloth very briefly to the dye bath through dipping instead of, or in addition to, immersed saturation, thereby controlling the degree and depth of penetration. In some cases seeds, pebbles, or other nonabsorbent articles are tied into the cloth to establish a uniform module for the resisted patterning. The folded or stitched areas of these primarily cotton cloths are used to create boldly striped or radiating patterns for robes, shirts, and tunics; large turbulent swirling motifs for bou-bous and caftans; or repeated, linear symbolic imagery for wrappers that serve as dresses and skirts. In Nigeria, the term adire means, quite literally, "to take, to tie and dye." Raffia is traditionally used as the binding or stitching material in African work that also includes stitched tritik and embroidered resists. 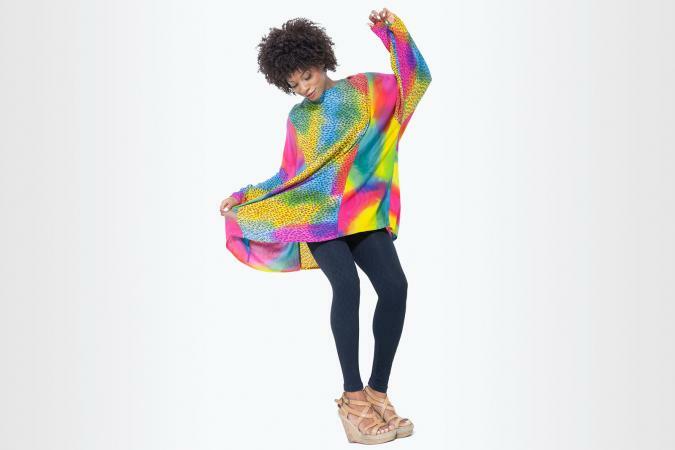 Because tie-dye is based on hand-dyeing that was often practiced as a domestic household industry, the process and its resulting visual qualities fell out of fashion during the mass-industrialization of textile printing during the nineteenth and early twentieth centuries. Rather, the hard-edged block, stencil, silk-screen, and roller-based printing processes were preferred. However, with the revaluing of the individual craftsman as handson producer during the 1960s, the characteristically blurred visual qualities produced by dye penetrating fiber regained favor because of the visual spontaneity and rich, uneven effects. The ubiquitous tie-dyed T-shirt became the symbol of the hippie generation. Since that revolutionary decade, many contemporary textile artist-craftsmen have explored and expanded upon a rich variety of tiedye methods, resulting in a renaissance of these techniques during the late twentieth century. Foremost among contemporary practitioners is American Ana Lisa Hedstrom of California, whose innovative exploration of arashi shibori dyed-silk textiles for wearable art garments, has become trendsetting. See also Dyeing; Resist Dyeing; Hippie Style; Indigo. Gittinger, Mattibelle, ed. To Speak with Cloth: Studies in Indonesian Textiles. Los Angeles: Museum of Cultural History, University of California, 1989. Excellent articles on various Indonesian textile processes in their cultural context. Larsen, Jack Lenor, with Alfred Buhler, Bronwen Solyom, and Garrett Solyom. The Dyer's Art: Ikat, Batik, Plangi. New York: Van Nostrand Reinhold, 1976. The classic authoritative source on worldwide resist-dyed textiles; superb visuals. Picton, John, and John Mack. African Textiles: Looms, Weaving and Design. London: British Museum Publications, Ltd., 1979. Thorough discussion of resist-dyed textiles; excellent photographs. Schoeser, Mary. World Textiles: A Concise History. World of Art Series. London: Thames and Hudson, Inc., 2003. Concise overview of textile processes, cultural interrelationships, and historical evolution. Wada, Yoshiko, Mary Kellogg Rice, and Jane Barton. 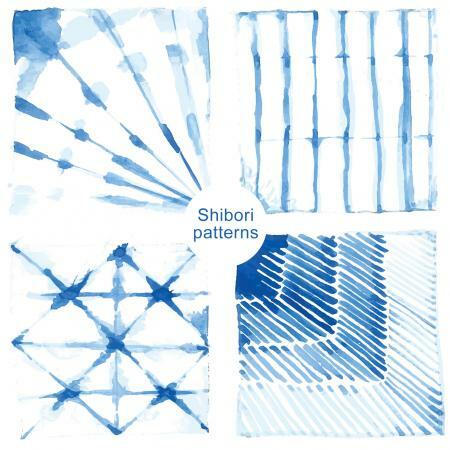 Shibori: The Inventive Art of Japanese Shaped Resist Dyeing: Tradition, Techniques, Innovation. Tokyo: Kodansha International, 1983. Pioneer source with outstanding overview of traditional techniques with detailed diagrams and contemporary examples.